The early Church Fathers clearly cherished this meaning of the Sacred Heart of our Lord. St. Justin Martyr (d. 165), in his Dialogue with the Jew Trypho said, "We the Christians are the true Israel which springs from Christ, for we are carved out of His heart as from a rock." Likewise, St. Iraneaus of Lyons (d. 202) said, "The Church is the fountain of the living water that flows to us from the Heart of Christ" (Adversus Haereses). Paulinus of Nola (d. 431) added, "John, who rested blissfully on the breast of our Lord, was inebriated with the Holy Spirit, from the Heart of all creating Wisdom he quaffed an understanding which transcends that of any creature." Although these are just a few brief examples from the times of the early Church, we find a profound respect for the Sacred Heart of our Lord as a font of His love which gave birth to the Church and continues to nourish its members. 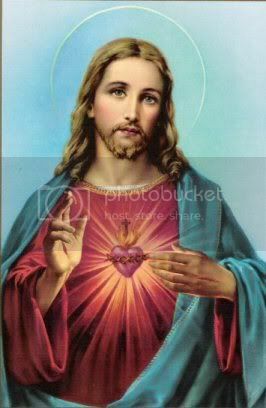 The devotion continued to grow during the Middle Ages and in 1353 Pope Innocent VI instituted a Mass honoring the mystery of the Sacred Heart. During the age of the Protestant movement, devotion to the Sacred Heart was practiced in hope of restoring peace to a world shattered by political and religious persecution. Shortly thereafter, the devotion escalated due to the fervor surrounding the apparitions of our Lord to St. Margaret Mary Alacoque (1647-90). For example, on Dec. 27, 1673, our Lord revealed, "My Divine Heart is so passionately inflamed with love... that, not being able any longer to contain within Itself the flames of Its ardent charity, It must let them spread abroad through your means, and manifest Itself to man, that they may be enriched with Its precious treasures which I unfold to you, and which contain the sanctifying and salutary graces that are necessary to hold them back from the abyss of ruin." The four apparitions provided the catalyst for the promotion of the devotion to the Sacred Heart: a feast day in honor of the Sacred Heart and the offering of our Lord's saving grace and friendship if the individual attended Mass and received holy Communion on nine consecutive first Fridays of the month. I will give them all the graces necessary in their state of life. I will establish peace in their houses. I will comfort them in all their afflictions. I will be their secure refuge during life, and above all in death. I will bestow a large blessing upon all their undertakings. Sinners shall find in My Heart the source and the infinite ocean of mercy. Tepid souls shall grow fervent. Fervent souls shall quickly mount to high perfection. I will bless every place where a picture of My Heart shall be set up and honored. I will give to priests the gift of touching the most hardened hearts. Those who shall promote this devotion shall have their names written in My Heart, never to be blotted out. I promise them in the excessive mercy of My Heart that My all-powerful love will grant to all those who communicate on the first Friday in nine consecutive months the grace of final penitence; they shall not die in My disgrace nor without receiving the Sacraments; My Divine Heart shall be their safe refuge in this last moment.